Pretty Perfect Pouch from Katie Loxton’s latest Spring collection in a powder blue hue. This new pale blue pouch meets all your day-to-night requirements with its elegant gold lettering to say ‘beautiful dreamer’ on the front and a gold branded zip pull with a soft grey fabric lining. Elegant clutch bag for evenings out or a ultimate beauty bag for your girly goodies. 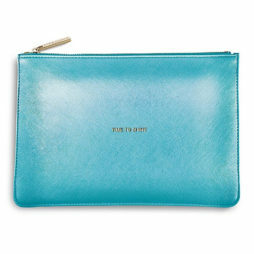 Pretty Perfect Pouch from Katie Loxton’s latest Spring collection in a powder blue hue. 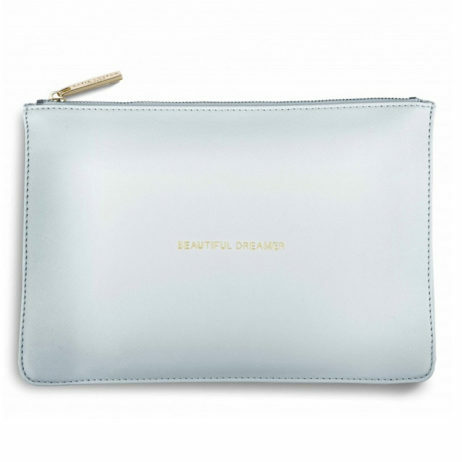 This new pale blue pouch meets all your day-to-night requirements with its elegant gold lettering to say ‘beautiful dreamer‘ on the front and a gold branded zip pull with a soft grey fabric lining. Elegant clutch bag for evenings out or a ultimate beauty bag for your girly goodies. 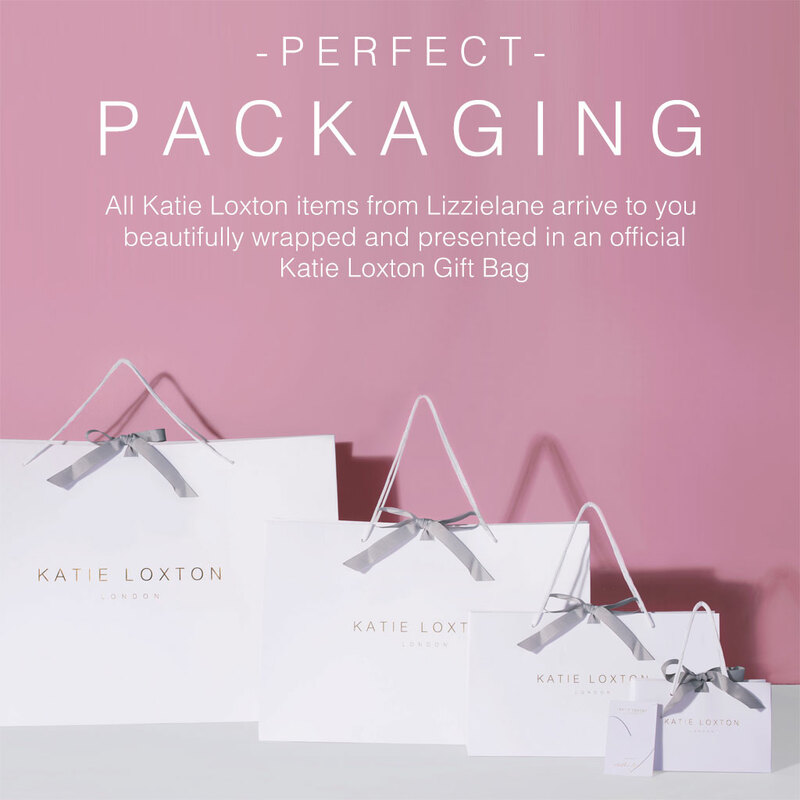 Each Katie Loxton bag arrives beautifully gift wrapped in tissue in an official Katie Loxton gift bag ready to give to loved ones. Katie Loxton, Katie Loxton Handbags and Travel Bags, Katie Loxton Perfect Pouches, Accessories - Scarves Bags and Watches, Bags. Katie Loxton Time To Shine Pouch Metallic Blue. It’s Time To Shine with this versatile new pearlescent pouch from Katie Loxton’s SS17 collection. This perfect pouch, with its gorgeous metallic, pearlescent finish, i sso easy to wear and will add a touch of luxury to every occasion. Blue in colour, this clutch bag is intricately etched in gold with the words ‘Time To Shine’ and is finished with a gold branded zip pull and grey fabric lining – perfect for keeping your keys, make-up and phone in order. 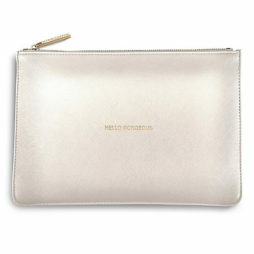 Katie Loxton Metallic White Hello Gorgeous Perfect Pouch. Change your look with this brand new pearlescent pouch from Katie Loxton’s SS17 collection. The perfect pouch to add chic and sophistication this summer with its gorgeous metallic, pearlescent finish, this white clutch bag will add a touch of glamour to every outfit. Etched on the front in gold is the saying ‘Hello Gorgeous’ with a gold branded zip pull and grey fabric lining. Behold this beautiful new pouch from Katie Loxton’s new collection. The metallic grey finish adds a touch of luxury to this popular pouch; etched on the front in gold are the words ‘magical moments’ with a gold branded zip fastener and a simple, grey, fabric lining inside.